So the stage race consisted of 4 days on 4 different Islands in Croatia. We arrived on the Monday on the Island of Baska after a 3 hr journey from Zagreb. The weather was similar to back in the Uk. My team partner Tom who was from Belgium was raring to go as I was also. I met him last year doing the Transpyr coast to coast in Spain and decided to do this event after many recommendations. We lined up with 600 other riders from 35 different countries so a real mixed field with some elite professionals aswell. The start was fast as we rode through cobbled streets of Baska along the the coast which was stunning. We started to climb along a road then headed up up some singletrack leading to a church at the top! This got the legs working Tom led v the way up the first long rocky climb! But we kept being distracted by the fantastic views we were greeted with along the way! We then got to the top on the climb and greeted the terrain which locals called the moon surface. As we rode across we then rode down a steep descent which was very rocky and narrow! But great fun. Some riders were not used to riding these conditions and walking. As we raced on making sure we always rode together with no more than a 2 minutes apart we came to the last climb of the day 50km in we were feeling strong tired by now and I was struggling slightly as I always do on the first days stage we started to head down towards the finish the weather stayed mild but windy which was good. 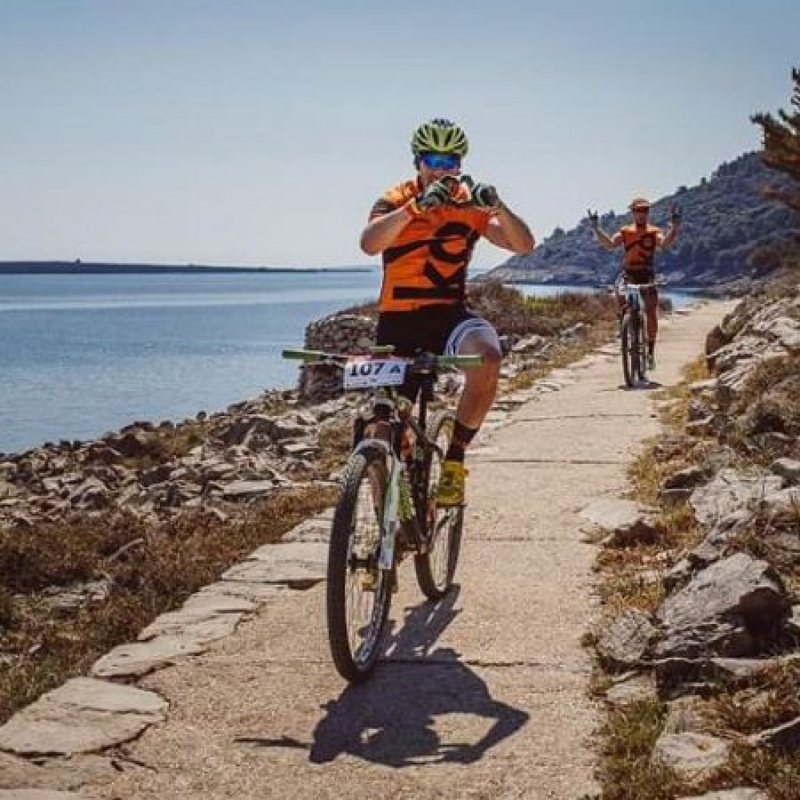 The last section was on the road as we came into Baska which was a relief for me as my energy had gone and just wanted to finish which we did slower than I hoped for. As already preparing myself for stage 2. So stage 2 and the Island of Cres has been cancelled due to wind and sea conditions docking at the port so race organisers have a revised route on Baska which was unfortunate but that's how it goes. So we rode the same course in most parts but I the other direction which was really good as there were some amazing downhill sections and I was feeling a lot stronger today after good recovery and eating and drinking properly today. We even made some time back today until the last 10 km I caught tyre on sharp rock. Resulting in quickly fitting a tube and finishing the stage really strong. So we started early as needing to leave the Island and hop onto ferry to start on the Island Cres. This was going to be another fun stage as we start on the ferry and finish other other side of the Island. The start was fanatic as we started with a steep Road climb out of the harbour then attacking some more fast rocky singletrack. We caught up with ghost team who we had been riding with at times in the last 2 stages but they were ahead of us in overall standings by 14 minutes. So we were keen to get some time back today the weather was warming which we favoured and the trails were technical and very rocky which again we loved. We were again gifted by some stunning scenery riding through olive tree plantations and some beautiful villages. We were feeling both very strong today and some other climbs were long and tight single track which were taking its toll on some teams. This is when knowing you race partner and how each ride because brings out the best in each us. Tom was very strong technicaly down hill but I was too far behind so we made up a lot of time passing many teams. We were 15 km from the finish and we caught the ghost team to there surprise. We soon passed them on the some fast flowing singletrack and we both pushed each on to make up as much time as we could. We finished a small village being cheered by local residents which was lovely an we had beaten the ghost team by 2 minutes and we had moved up into the top 60 in our category some 17 places better then yesterday. So we were excited and looking forward the final stage already. So we woke early and keen to start the Last day as we had moved Islands for the final time via a bridge not ferry this time. The hotel were stayed was stunning right by the sea and looking forward to relaxing at after the race. We started very strong leading out our wave of riders as we rode along by the sea these was shining so couldn't have been better. Today was a short and fast stage and aiming for 2,30hr to finish the stage even though we both didn't want it to end, We past the ghost team early on a steep climb and we never looked back from there. We were spoiled again by some breathtaking scenery riding through tightrope trails and some fast flowing singletrack as the sun gazed down on us. The stage was coming to the end as we rode along a costly walking path which was lovely with the finish in sight we were excited but at the same time sad as such a fantastic race was coming to the end. We finished strong as we started passing teams as they enjoyed the views towardsthe finish as we crossed the line we were relieved and so pleased have done it as the trails had taken casulty to teams and bikes. We ended up beating the ghost team by some 15 minutes and beatingthem overall and finishing in 2hr 31 minutes and just outside the top 50 so really happy. This was a fantastic event with nearly 600 riders competing in pairs and different categories, So well organised and some fantastic trails and scenery! I would strongly recommend it but it isn't for everyone as some very rocky trails. And already a maybe again for next year!!! !